Polas are increasingly turning their backs on multiplexes in favour of smaller cinemas – preferring cheaper tickets, fewer adverts and more varied programming – according to the latest data from the Polish Central Statistical Office. 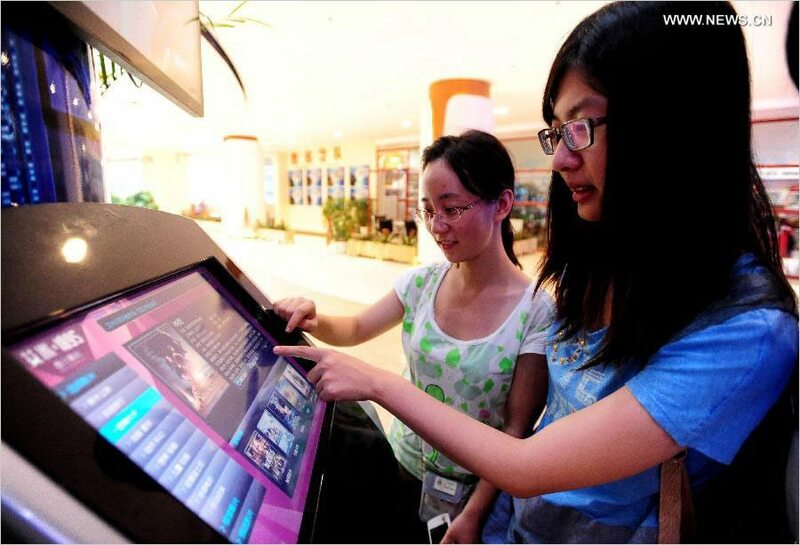 The share of the largest, multiplex cinemas has declined from 58.1 percent in 2012 to 55.2 percent last year. Smaller cinemas are slowly gaining ground. Those with three to seven screens now have 30 percent of the market, compared to 27.4 percent in 2012. The smallest venues, with one or two screens, have increased their market share from 14.5 percent to 14.8 percent. This translates into some 100,000 viewers more year-to-year. China – Having only bought into the cinema market last September, Huayi is selling out and more than doubling its money. Huayi Brothers Media has agreed to sell its 20% stake in Jiangsu Yao Lai Studios Management, a regional cinema operator. Huayi is selling to Songliao Automobile and will receive RMB464 (US$75 million) for the stake. 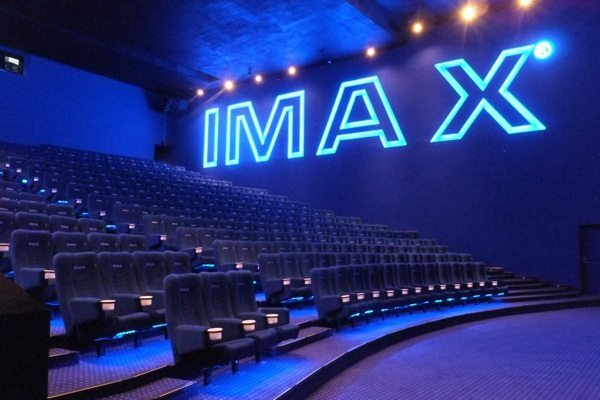 Imax – Zacks has issued an analyst report on Imax that is fairly bullish but also points that growth in the future will not come from equipment to the films they show. Recently, IMAX also signed an agreement with Europe’s major cinema operator, Nordic Cinema Group, to install a theater at the latter’s SF Bio multiplex. Moreover, the company has teamed up with South Africa’s leading movie chain company, Ster-Kinekor, to launch its first theater in the country. India – Did you buy shares in Inox three years ago? You would have been twice as well off investing in PVR shares. Why? More multiplexes in the north and west of the country. 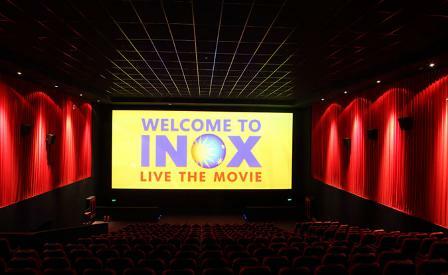 The stock of multiplex company Inox LeisureBSE 1.78 % has lagged behind its larger peer PVR over the past three years, delivering 237per cent returns compared with 472per cent of its rival. This gap can be attributed largely to PVR’s higher market share in the northern and western regions of the country where Inox did not scale up its presence. UK – Rentrak is now releasing box office figures for event cinema and it makes for interesting reading: NT Live dominates, rather than opera, including keeping the Pythons from the top spot. The market has almost doubled year-on-year. But will the new Doctor Who be the year’s biggest event cinema opening? 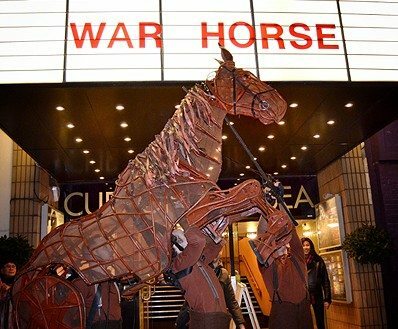 Latest data from Rentrak: Event Cinema box-office in UK & Ireland for January-July 2014 is £17.9m (top title War Horse – NT). Comparable total for 2013 – £9.5m. Forecast for full year 2014 – £30m. India – I missed this article when it first came out (thanks to Chuck Goldwater for pointing me to it). Interesting attempt to capture stage performances of plays in India for the big screen, though not necessarily cinema. However, I predict that this will sadly only have a niche interest abroad as these things are so often star-driven (even in the case of NT Live). CinePlay has produced five plays so far and has fifteen productions in the pipeline. 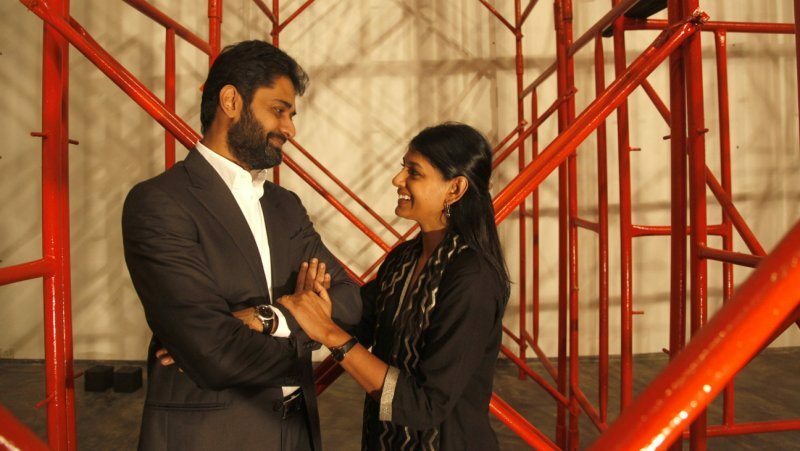 In addition to Between The Lines, other productions include iconic Hindi play Adhe Adhure (which has been staged since the sixties) and Dance Like A Man. CinePlay has hosted ticketed screenings at cultural venues – instead of cinemas – such as Mumbai’s National Centre for the Performing Arts and Delhi’s India Habitat Centre. 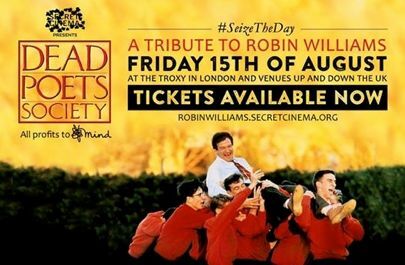 UK – The film and cinema world mourns the passing of Robin Williams, but Secret Cinema has gone one better by organising a charity screening to benefit mental health charity Mind. Partnering with mental health charity Mind, Secret Cinema will hold the screening at the Troxy in East London – the event on Friday August 15th will also feature poetry, music, live performance and special guests. Fabien Riggall, founder of Secret Cinema said: “We are looking for people everywhere to join us in staging a screening to honour the memory and amazing light of Robin Williams. USA (CO) – How do you attract hipsters who reject cars to a drive-in type of event – call it a cycle-in. 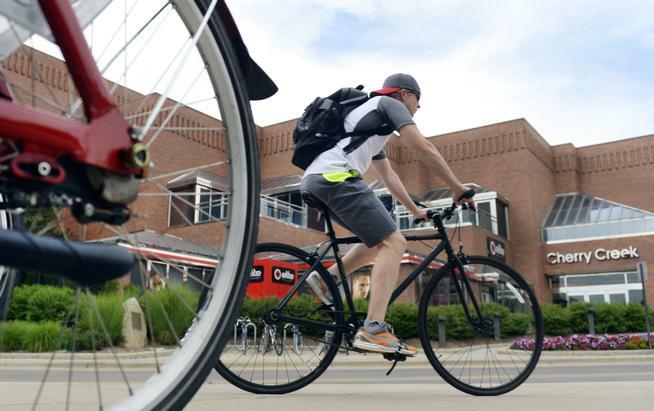 New Belgium Brewing and REI are partnering to present a series of bike-in movies to benefit Bike Denver, a grassroots non-profit bicycle advocacy organization. The first movie is “Dumb & Dumber.” The show starts at 7:30 p.m. at 1416 Platte St., next to the REI building, which is accessible from the Cherry Creek Bike Path and the Platte River Bike Path. Bring a low-back chair or a blanket. Canada – But why this bias towards land-based modes of transportation? 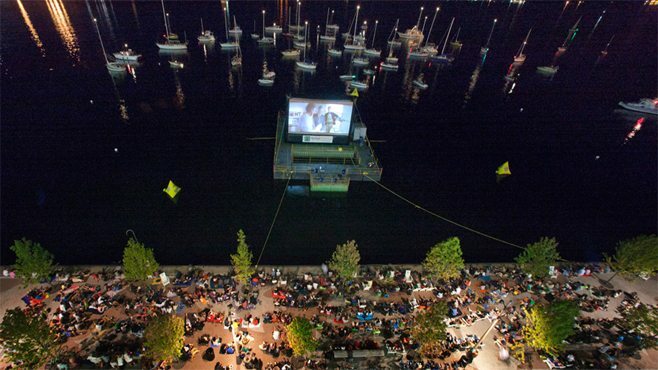 Fear not, Toronto’s Sugar Beach hosts the world’s first sail-in cinema. Australia – It seems that Curzon has inspired at least one chain in Australia to venture into the video-on-demand field. 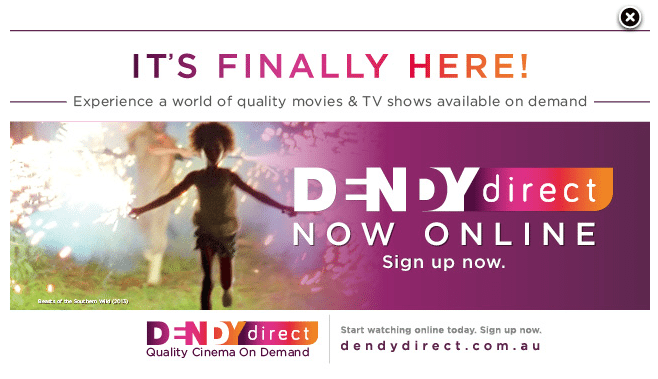 Dendy Direct will be available nationwide across Australia and will offer customers a curatorial approach to video and film content via mobile and other connected devices, operating as a pay-per-play model with films and TV series. Australia – Another day-and-date venture in underway in Australia, this one partly prompted by the perception of cinema ticket prices being too high. Victorians will be able to watch Kasimir Burgess’ debut feature Fell later this month at the Australian Centre for the Moving Image or on VoD for the same fee- $10. The initiative continues the novel approach to exploiting the film being undertaken by producer/distributor John Maynard. Fell was available on VoD in New South Wales, Queensland, the ACT, South Australia and Northern Territory for 50 hours after its world premiere at the Sydney Film Festival. Atmos – Time for a small serving of humble pie. 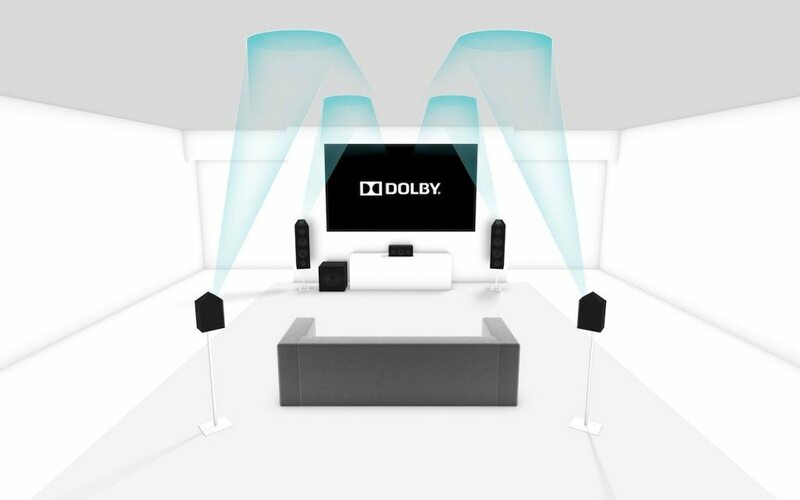 We had previously said that Dolby would bypass your living room for your headphones. It seems that Dolby is now focusing on both, which means that they either feel that there is enough momentum in the cinema market to focus on the home cinema market – or it is an admission that they can’t roll out in cinemas any faster, so might as well focus on the core business or licence fees for the mass consumer market, now that they have enough titles mastered in Atmos. Apparently you also won’t need an overhead speaker in your lounge. Noise-reduction specialists Dolby Labs is about to debut its latest immersive surround sound system, Atmos, onto home entertainment systems. More than 100 Hollywood titles are already mastered in Atmos and Dolby says it has created the authoring tools that would permit studios to create an Atmos audio version for the home. Gizmodo has been trying it out in the home and is suitably impressed. Oman – Vox Cinemas has launched the biggest cinema screen in Oman – with Atmos. More than 220 guests attended the reception held before the première of The Expendables 3 at VOX MAX which has a 17m wide screen, the largest in the sultanate. “Introducing VOX Cinemas to movie-goers in Qurm is a milestone for us,” said Cameron Mitchell, CEO, Majid al Futtaim – Cinemas, adding, “We have seen fantastic admission rates in both Muscat City Centre (MCC) and QCC in the short time they have been open. With seven screens at QCC and ten at MCC, we are proud to offer the largest cinema complexes in the sultanate. 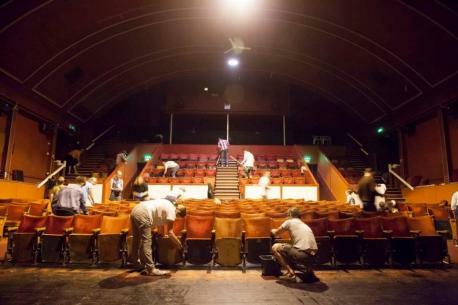 UK – Great to see communities (and businesses) rally around to save their old cinemas – and not be afraid to roll up their sleeves and get scrubbing. People who were part of the fight to save the Regent Cinema in Redcar held a community clean-up on Sunday. The clean-up saw more than 20 members of the community roll up their sleeves and get stuck into sprucing up the unique interior of the cinema, on Newcomen Terrace on Redcar’s seafront. 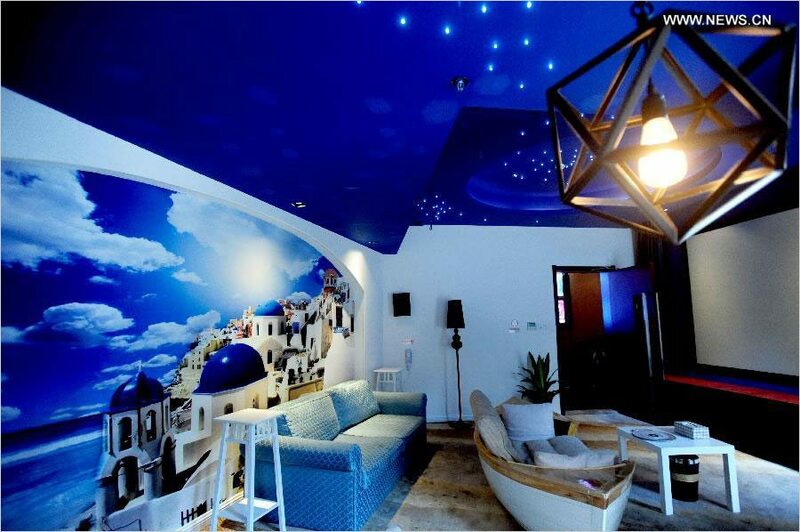 The first customized cinema has opened in China. I suppose if you can’t afford your own Imax/Atmos home cinema, then this is the second best option.